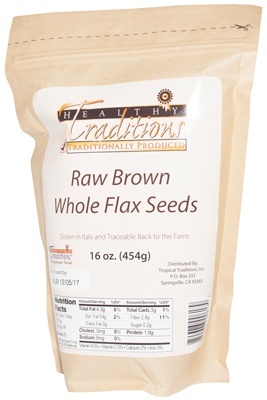 Healthy Traditions announced today that they have added Raw Brown Whole Flax Seeds to their line of GMO-tested and Glyphosate-tested products. 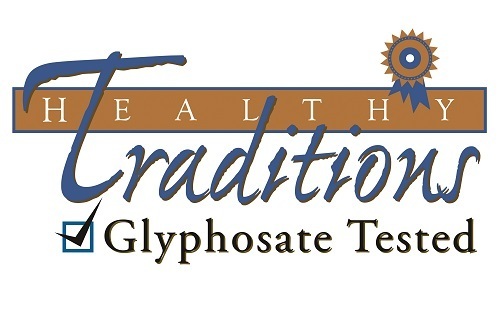 Healthy Traditions is a brand of Tropical Traditions, and in 2014 Tropical Traditions tested their USDA certified organic grains for the presence of glyphosate. They were shocked to find many of their grains were contaminated with the herbicide glyphosate. (See: ALERT: Certified Organic Food Grown in U.S. Found Contaminated with Glyphosate Herbicide). In their search for new products that would test clean for the presence of both GMOs and glyphosate, they had a very difficult time finding flax seeds that tested clean for the presence of glyphosate. The area of the U.S. where most flax seeds grow are in northern states where desiccating crops with glyphosate is common practice to control the harvest prior to snowfall. Finally, almost 2 years later, they obtained samples from a farm in Italy that tested clean on the samples which were tested. They now offer this very high quality flax seed to their American market. These brown flax seeds are completely raw and unprocessed. They were grown in Italy and are traceable back to the farm that raised them. The farm is certified organic and a sample of the seeds were lab tested for the presence of glyphosate and none was found. These flax seeds have earned Healthy Traditions’ highest standards and carry the Traditionally Produced certification. Omega 3 Fatty Acids – Flax seeds are a very good source of Omega 3 fatty acid in the form of alpha-linolenic acid, or ALA. The ALA present in flax can also remain intact after baking, so fresh ground flax can be added to breads and pastries and still retain its Omega 3 advantage after coming out of the oven. Flax seed has a high ratio of Linolenic (omega-3) to Linoleic (omega-6) fatty acids. While many other plant seeds contain a higher ratio of omega-6 fats, flaxseed is the one of the few seeds that contains a much higher ratio of the essential omega-3 fats. Lignans – Flax seeds are the richest dietary source of lignans, which are polyphenols that act as antioxidants. Mucilage – Flax seeds are a rich source for mucilage, which is the thick glue like substance that helps the seeds to store food and water and also aides in the seed’s germination. This mucilage acts as a water soluble fiber in the body, but without the high carbohydrate content of other fibers. Flax seed is 28%-35% fiber, 1/3 of which is soluble, and the other 2/3 insoluble. Soluble fiber also plays an important role in maintaining the “good bacteria” in our bowel, like Lactobacillus Acidophilus and Bifidobacteria. Insoluble fiber increases the bulk of stools. Flax seeds can be enjoyed in a number of ways from raw, soaked, sprouted, boiled or ground and can be treated as you would other seeds or nuts. However, flax seed must be finely cut into a meal to get maximum benefits of the OMEGA-3 oil and dietary fiber. We recommend that you buy a coffee grinder and dedicate its use to grinding flax seeds. Once ground, the flax seeds should be consumed quickly, as the oil inside the seeds oxidizes rapidly. The recommended daily amount of flax seeds to eat is about 1–2 Tbsp. The most beneficial amount for maximum nutritional value of ground flax seed is 2 tablespoons daily. It can be mixed into 10–12 oz. of juice or water. Make sure you use plenty of water when adding flax seed to your diet. Ground flax seed can easily be added on top of dishes including: baked products, stir-fry dishes, soup or stews, cereal and yogurt. Flax seed is 35–40% oil so a similar amount may be omitted from any recipe requiring oil that also includes ground flax seed. Similarly, about 1 Tbsp. of ground flax seed steeped in 3 Tbsp. of water for 2-3 minutes will substitute for one egg in recipes. Flax seed contains NO GLUTEN for those with gluten allergy. More about Healthy Traditions Glyphosate-tested program. © Copyright 2002-2019 Tropical Traditions, Inc. All Rights Reserved.